Katoomba Falls was a gorgeously situated waterfall that Julie and I thought was up there with Wentworth Falls as the most scenic waterfall of the Blue Mountains. 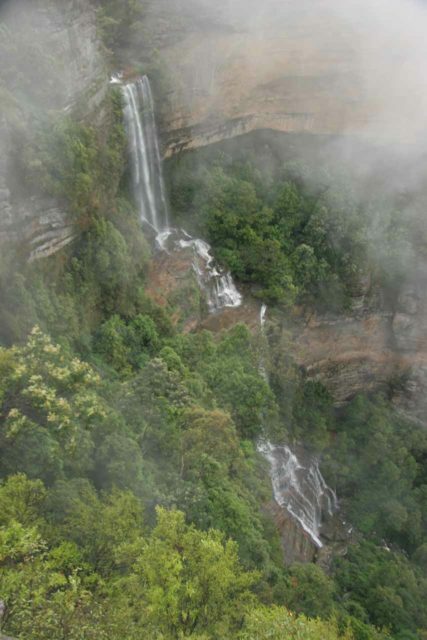 When we first saw this falls in November 2006, it was under some rainy weather where the falls tended to be shrouded by clouds. 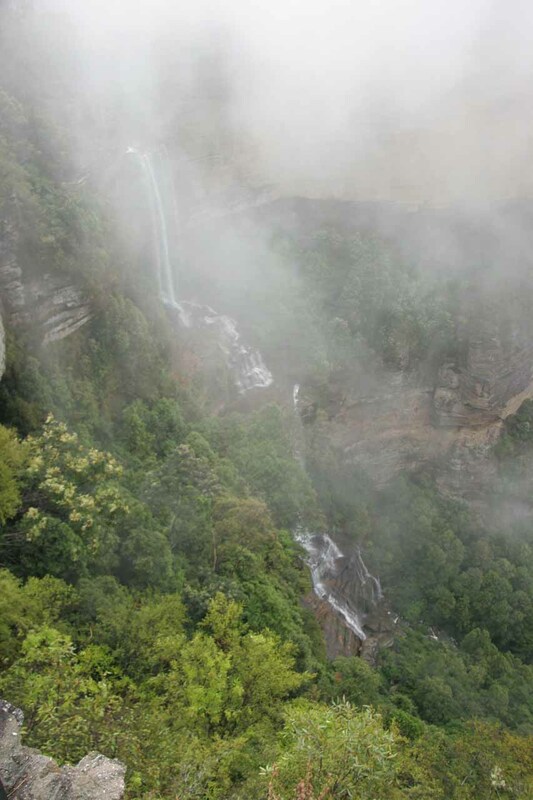 We really had to wait for a break in the clouds before the waterfall revealed itself (then the clouds retook the falls shortly thereafter). 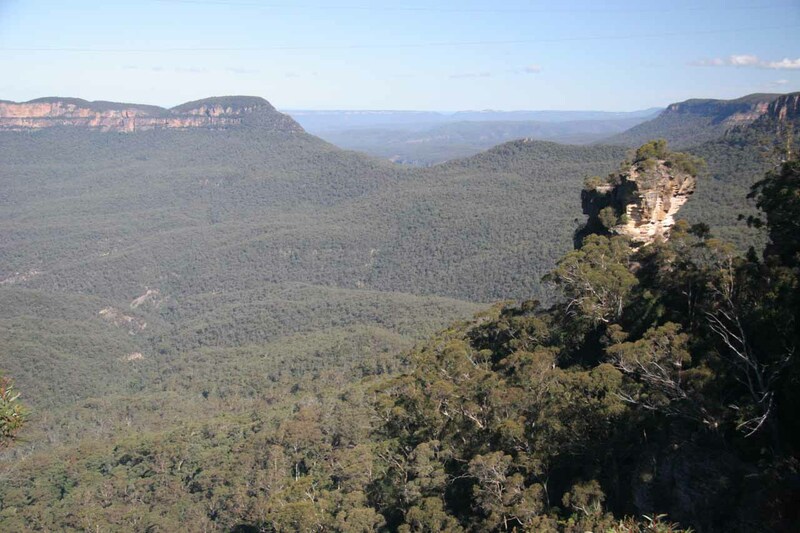 However, when we came back to see the falls again in May 2008, it was under sunny skies, and as you can see from the photo at the top of this page, it was surrounded by the signature cliffs and panoramas that made the Blue Mountains famous. 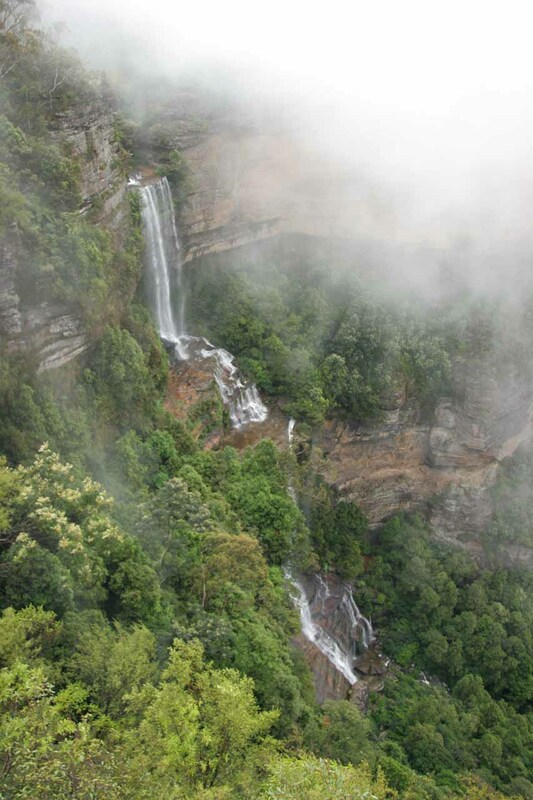 We’ve been under the impression that most (if not all) Blue Mountains Waterfalls tended to have short seasons. 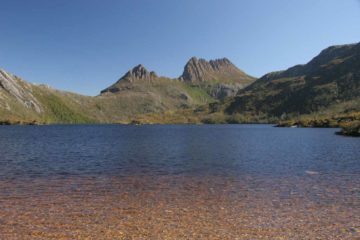 However, with our visits occurring during the Spring and Autumn, we were either lucky with the timing of recent rainfall or perhaps the falls had greater longevity than we gave it credit for. It was hard to say. 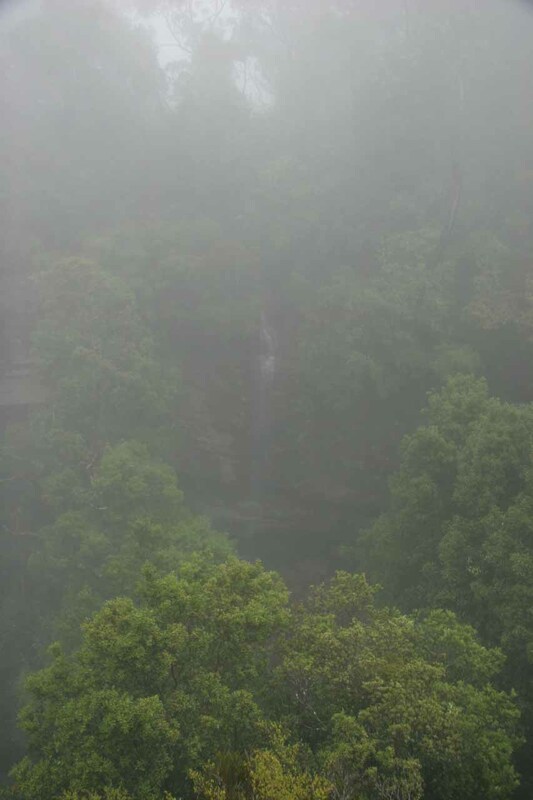 Speaking of heavy rain (regarding our Spring 2006 visit), we had a catch-22 problem where the persistent rains filled the water catchment for the falls, but the clouds obscured the views of it. 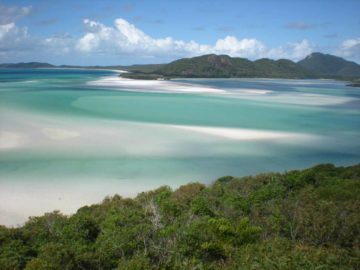 In drier times, the views would be clearer, but then we’d imagine there would be the higher likelihood of the waterflow being significantly diminished (unless our May 2008 visit was more the rule rather than the exception). 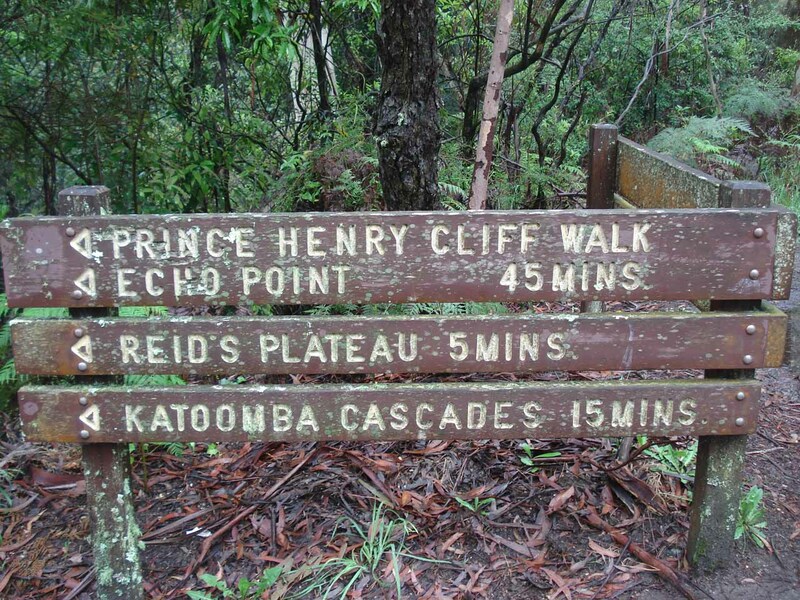 From the nearest car park (see directions below), we went on a short walk towards the many lookouts at the edge of the cliffs overlooking Katoomba Falls as well as the expansive panoramas that the falls faced (provided the clouds weren’t blocking the views). 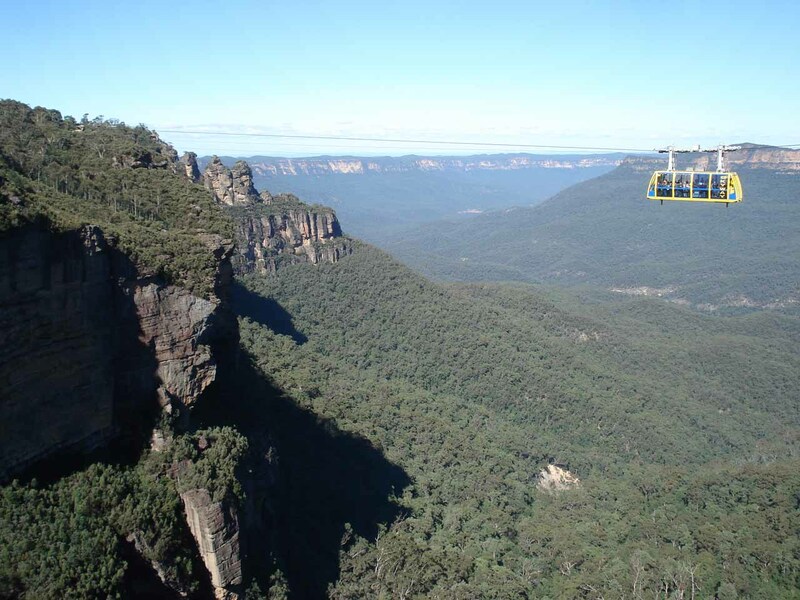 We noticed that there was also a cable car called the Katoomba Scenic Skyway that looked like it would’ve yielded more frontal views of the impressive Katoomba Falls as well as other suspended-in-mid-air views of the panoramas all around. 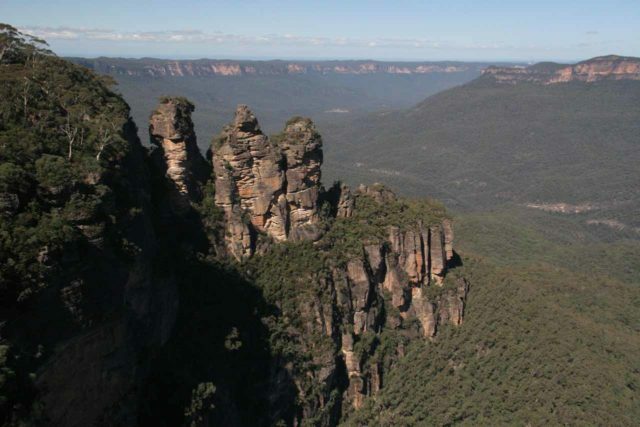 We also noticed that the cable car passed by the famous rock formation known as the Three Sisters at Echo Point (which had its own separate car park and lookout though it was possible to hike to it from the falls as well). 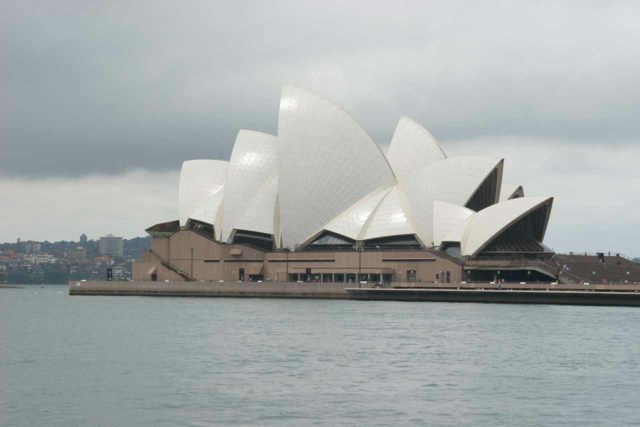 That said, we didn’t do the Skyway cable car so we can’t say more about it. 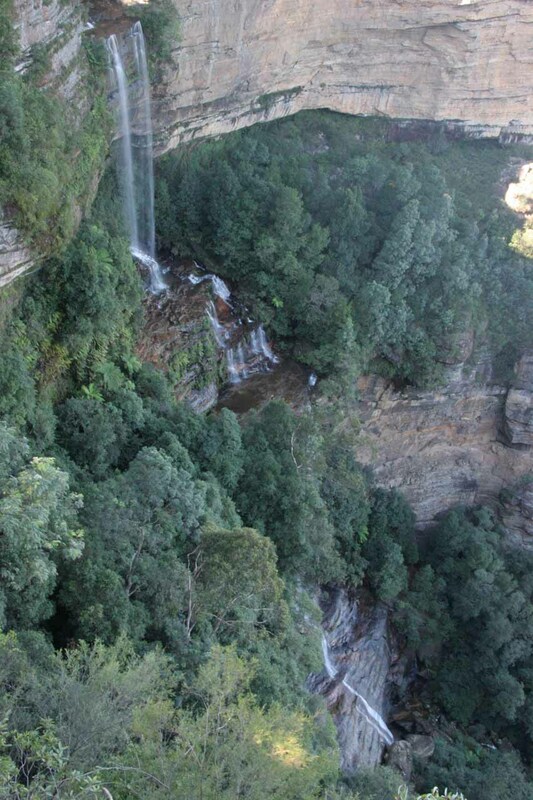 There was also a walk that went towards the bottom of Katoomba Falls. 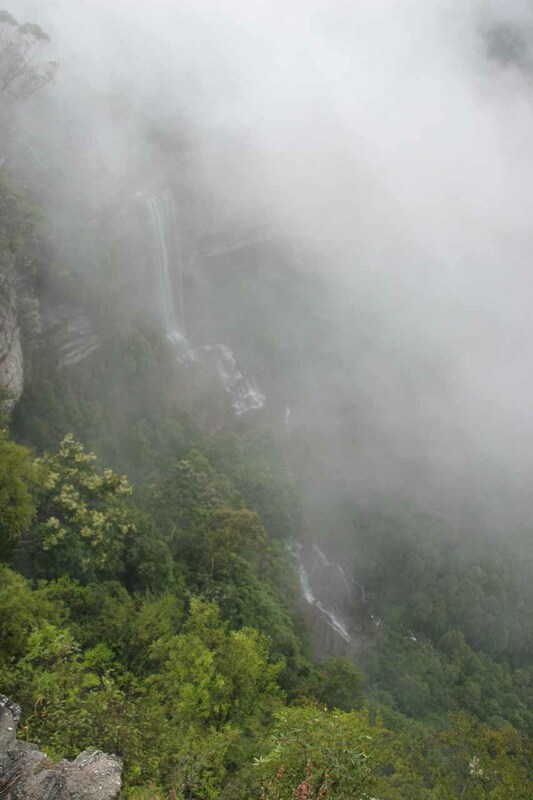 We saw a family go down there when the clouds had blocked the view of the main waterfall. We opted to wait for the clouds to part instead of joining them down there so we can’t say anything about what that hike was like. 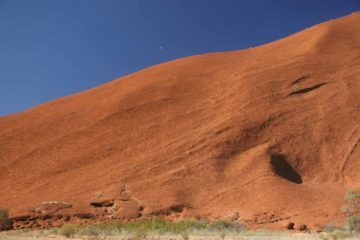 Speaking of tracks, there was a large network of them both on the rim and descending into the valley below (with more waterfalls on the way). 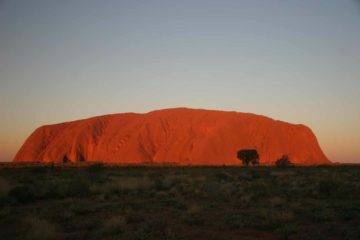 Perhaps one of these days, we could come back here and devote a bit more time to explore these tracks more thoroughly. 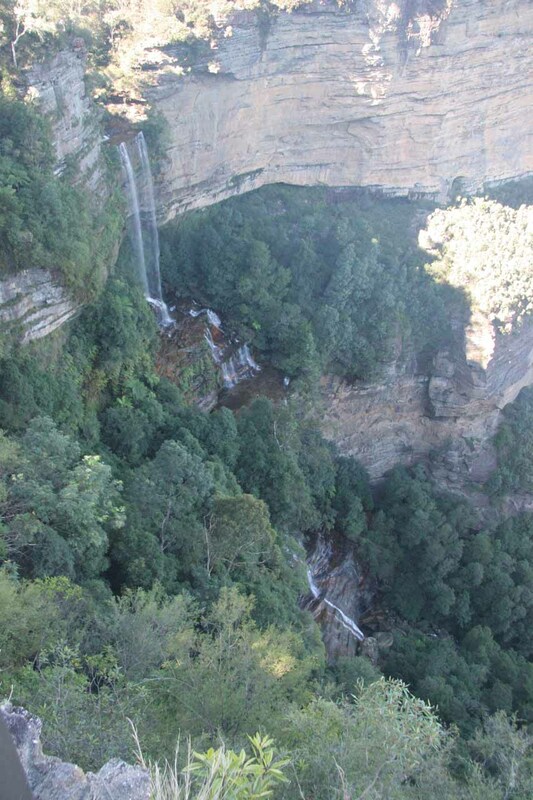 Finally, during our November 2006 visit, Julie and I also noticed a smaller waterfall known as the Witches Leap. 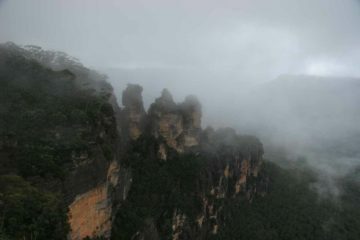 It had a separate viewpoint nearby the main viewpoint though the clouds were very stubborn about letting us have a clean look at it. The falls is on the southern outskirts of Katoomba town, which itself is a short distance west of the Wentworth Falls town and about 2 hours drive west of Sydney. 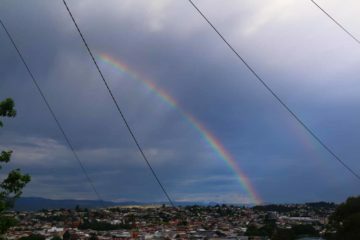 As we were entering the town of Katoomba along the Hwy 32 (Great Western Hwy), at the Parke Street turnoff, we turned left at the roundabout onto Bathurst Rd. 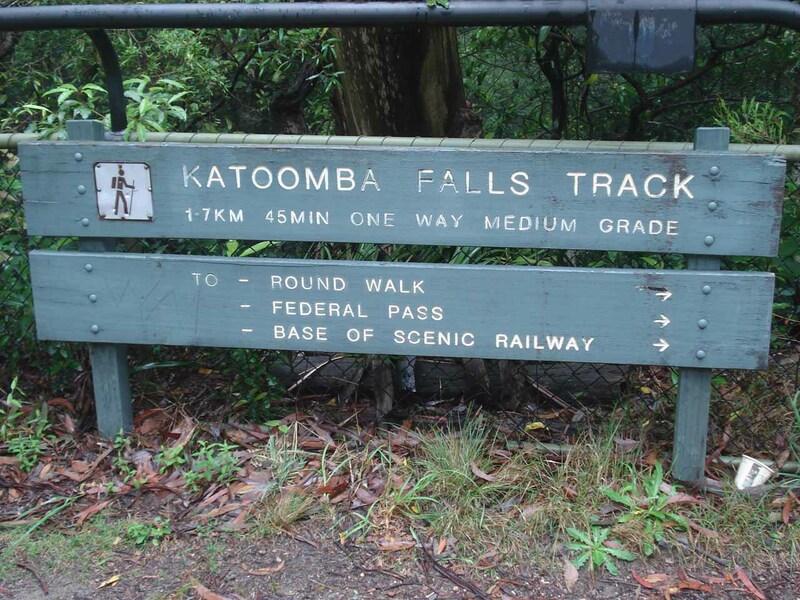 Then at the next roundabout, we turned right onto Katoomba St. We followed Katoomba St for about 1.4km to Katoomba Falls Rd on the right. 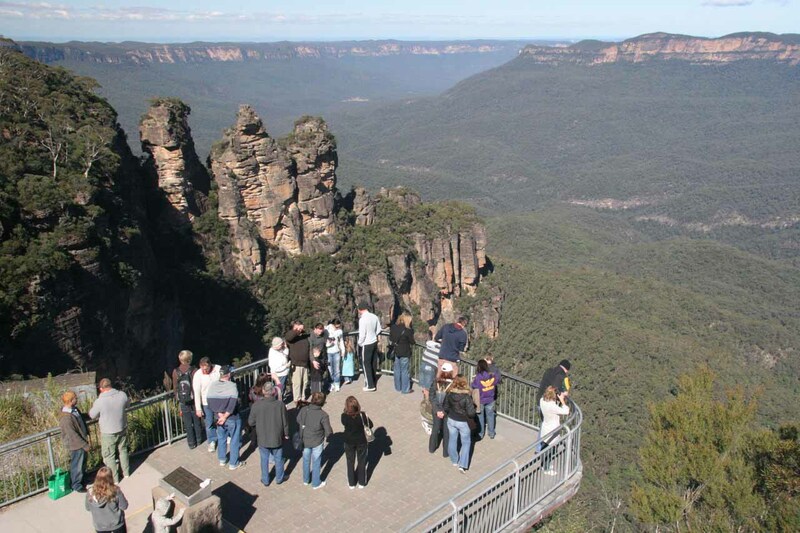 Then we took the Katoomba Falls Rd until we saw the Katoomba Falls Kiosk where there was a small building as well as spillover parking across the street near Cliff Dr. 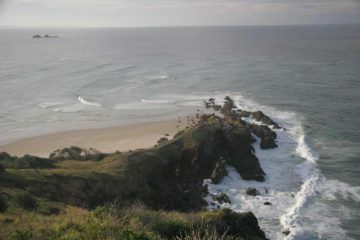 The walks and overlooks were right behind the kiosk. If you’re up for the Scenic Skyway Cable Car, you continue driving west along Cliff Drive for a couple of minutes until you get to the gondola station. I think the Skyway has its own car park, but if not (or it’s full), then you can park at the kiosk and walk towards the Skyway.